A second council boss facing the sack over the handling of a safeguarding case has resigned. Mark Carriline, the executive director of children, young people and culture at Bury Council, has quit weeks after chief executive Mike Owen. A disciplinary panel found him guilty of serious misconduct and recommended he be dismissed without notice. 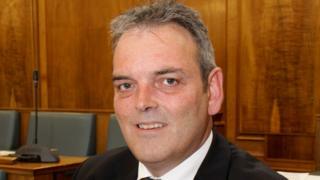 It related to reports councillor Simon Carter made indecent images of children which he later admitted in court. Carter, who represented Tottington ward from 2012, was given a three-year community sentence at Bolton Crown Court in October 2015. Bury Council said its human resources panel had recommended Mr Carriline, who was understood by the BBC to be on more than £100,000 a year, be dismissed without notice last month. The recommendation was due to go to a full council meeting before he quit. Bury Council said in a statement: "Mark Carriline, the council's executive director for children, young people and culture, tendered his resignation this week which takes place with immediate effect. "No payment has been made to Mr Carriline on his departure except that relating to outstanding holidays." It added that Karen Dolton will continue in the statutory role of interim director of children's services.